Life has an interesting way of making internet activities become part of real life. On Saturday, I was at the 35th College Day of Temasek Junior College, its annual prize giving ceremony. I was there as the representative of the College Advisory Board to present prizes, as well as to receive an award of my own. 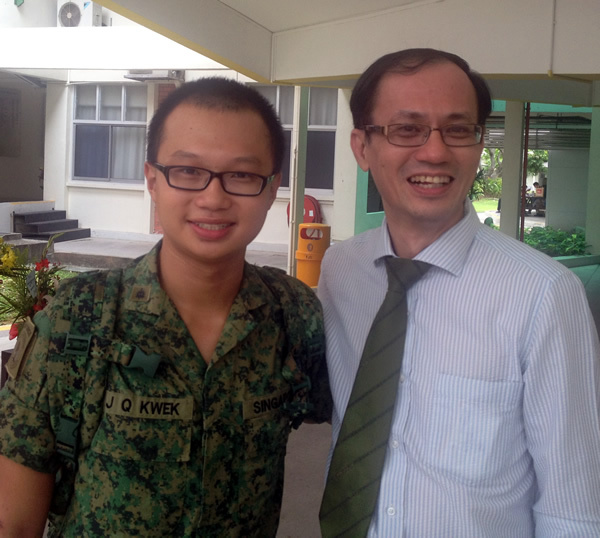 Of the some 200 student prize recipients, one name stood out for me – Kwek Jian Qiang. Some may recall his letter to the TODAY newspaper in Dec 2011 comparing facilities in junior colleges and ITEs that had many netizens angry and flaming him. Upon reading the letter in the newspaper, I immediately whipped up a quick blog entitled, “Educating our youths to develop empathy, appreciation and resilience“. I was seriously concerned about what I feared was a growing lack of empathy in an increasingly competitive education system and an attitude of entitlement by those who had performed better. To Jian Qiang’s credit, he very quickly apologised online after the backlash from netizens. I spoke to Jian Qiang after the prize presentation. He repeated what he said in his online apology that he had learnt from the letter incident and had since moved on. I was particularly interested in what community services he had done to win the prize. He shared that he got involved in community projects quite by accident through the KTM railway land after reading about Nature Society Singapore’s fight to preserve the greenery. He felt moved to take some personal action and linked up with the Nature Society to organise the Team Naturact Fun Carnival 2011, an event to raise funds both to protect the greenery around the railway land and to raise awareness of the plight of the Kranji Marsh. He later became active in the Bedok CC, spending his weekends in various fund raising events for the needy. In his second year in TJC, as part of the college’s Mazarin Programme (a talent development programme with mentorship by senior staff of the college), he chose to work with the AG Home, a refuge for troubled girls who faced abuse and neglect at home, ran afoul of the law or who have lost their parents at an early age. He worked with the local community to raise $20,000 which went into enhancing the Home’s ability to take care of the girls and funding the girls’ education. Jian Qiang also shared about other community projects he did with the college for the underprivileged in the Bedok neighbourhood as part of the college’s Community Involvement Programme (CIP). I recall my own schooling experience too, when as a then-shy teenager in St Patrick’s School, I was thrust into community projects through my St John’s Ambulance Brigade ECA (now termed as CCA). I found volunteering for first aid duties in public events exciting. I ended up clocking some 100 hours a year in such duties. That process opened me up and it started a life-long journey of active community involvement. When I entered Temasek Junior College as a student, I took part in many ECAs and continued through with many community projects right till today. Some activities have brought me to interesting places such as Bhutan and the interiors of Sarawak and Kalimantan. As I look back at my own schooling experience, it was the ECAs and the many activities I took part in that had shaped me more than the knowledge from books. So I was glad to find a young man like Jian Qiang who also believed that life must be lived to the fullest and without regrets, and that academic achievements and career should not be everything. It is good to know that Jian Qiang will soon be reading Social Sciences at SMU. From the community services activities he had been doing and his winning the prize for community services in a college that has community service as one of its niche focus, I am sure this young man has learnt from that infamous letter experience and demonstrated that he has indeed changed.